Harvey (Dustin Hoffman) is a bit like a jigsaw piece, looks like it will work, has the right colour and shape but no matter how hard you try, it will just not quite fit. Of course it will fit somewhere quite perfectly, it’s just a question of finding where. Rushing from his job as a Jingle writer, where computers have replaced people and business relationships trampled by more youthful counterparts, Harvey arrives in London for his daughters wedding. Harvey is then subjected to the death of a hundred slights. Staying at a hotel by himself, despite the rest of the wedding party, including his ex-wife and new beau, staying at a rented house. Wearing a white suit with the security label still attached, as he was assured everyone would wear white. Being moved from the head of the table to the end and finally the ultimate humiliation, his daughter stating simply that she will be given away by her stepfather. Attempting to make a speech, in an attempt to regain some credibility as the daughter of the bride, his mobile phone constantly rings or vibrates. He eventually stumbles out of the restaurant, dislodging white decorative gravel in his wake. Rushing to the airport to return to New York for his “must close’ sales pitch, he misses his flight and is promptly fired on the spot. 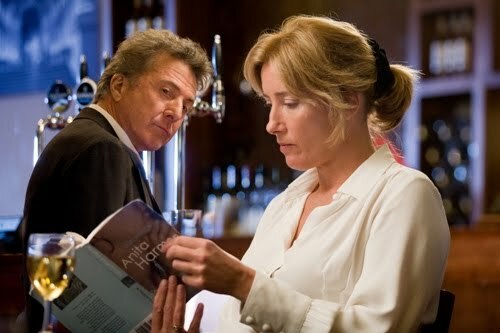 Drowning his sorrow at the airport bar, he meets or rather re-encounters Kate (Emma Thompson). Following a guarded conversation that most people would recognise, a tentative relationship begins. At every turn you can feel that the delicate and brittle romance could break, from the weight of emotional baggage, caution and reluctance to take that chance. All tempered with the midlife knowledge, that perhaps taking a chance might not be worth the possible pain. The social awkwardness and the slights handed out to Harvey, are at times painful to watch. The acting is natural and it is a treat to actually watch actors acting, especially Harvey as the last vestiges of his self worth are stripped from him. No moving camera or fast edits, just meaningful dialogue and time for the actors to show in their face and most importantly eyes, what the information given or received really means to them. The feeling that Harvey, despite being at his own daughters wedding, feels uncomfortable, almost unnecessary and out of place, is beautifully sketched in a few short scenes. Whilst the movie does follow the normal romantic arc, a struggle to meet, followed by adversity and a hopeful ending, the destination is less important than the journey. Whilst short, there is brief time for a small subplot which is not wholly necessary but provides comic relief and interruption to the main romance. As is obvious, Kate has little else to distract her, a sense of annoying but welcome interaction with someone she cares about, despite all it entails. Kate is a practical no nonsense woman, who has tried and is still trying to find, that elusive person with whom she can share her life. One feels she is on the cusp of giving up, realising that the chances of finding someone decent, perhaps outweigh the inevitable pain of trawling through the losers and liars she will statistically encounter. Perhaps not the right word but bearing in mind her profession perhaps doubly appropriate, the kind of woman that would look at life this way, despite yearning in her heart for it not to be true. “I am more comfortable with being disappointed. I am angry with you for taking that away from me”, Kate confides at one point. Thompson is well cast in this role and holds her own well against Hoffman in the less showy role. Portraying a character and scenes, notably the “blind date”, that will be readily identifiable to many of the audience. Screen romances are all about on screen chemistry and it fair to say, that despite the obvious age difference, there is plenty of spark and one finishes the film wanting to spend more time with the characters. Effectively a “two hander” with two fine believable performances, illustrating the tentative beginnings of a late in life romance that is almost so fragile, it is difficult to watch unfolding. For anyone that have ever experienced social awkwardness, is over 40 or just delights in watching two actors given a chance to actually act. Not many movies are made for this target audience, here is a good one, don’t miss it.